Are you looking for an authorized Evinrude E-TEC Parts and Service Dealer? Day Brothers Boats on Lake Champlain has certified Evinrude E-TEC technicians and mechanics on location. When it comes to BRP parts on Lake Champlain Day Brothers Boats is the area’s first choice. Serving Burlington Vermont, the Adirondacks, Lake Champlain and Montreal since 1948. Here is a list of some popular Evinrude E-TEC parts we stock in our Plattsburgh, NY store. engine boats by using a single control lever. B ENGINE TRIM A single master engine trim switch is installed on the shift lever to control all engines. Conveniently located individual trim switches allow easy operation and fine-tuning adjustments. C F-N-R INDICATORS Forward-Neutral-Reverse (F-N-R) indicators easily identify gear position for added safety and usability. D RPM TUNE This Evinrude exclusive is a virtual RPM cruise control ranging from idle to wide-open throttle. Press the “RPM” button on the control to fine-tune the engine RPM slightly higher or lower; this makes it easy to find the exact trolling speed or optimize fuel economy at cruise, perfect for Lake Champlain. • Home page – general cruising and performance information including RPM, trim level, engine water temperature, fuel economy MPG, fuel consumption GPH and boat speed. • Engine page – in-depth monitoring of one or up to 4 Evinrude E-TEC G2 outboards. • Fuel/Fluids page – precise readouts of fuel levels up to 4 tanks, engine oil levels and water tanks. • Vessel page – accurate readouts of battery voltage, boat speed, and fuel economy. • Trip Logs page – offers detailed information regarding trip distance, fuel economy, average speed and more. user to optimize engine throttle and trim adjustment for instant changes and the most efficient operation. • A status bar is always visible with gear position, GPS clock, active throttle, and fault notifications. The RX4 is a no compromises 4 blade propeller. RX4 masters the power curve of the Evinrude E-TEC G2TM engine. It is optimized for traction and rough water performance with industry leading speed, acceleration, and fuel economy. It delivers superior bow lift on larger boats and does not slip in turns. The perfect propeller for Lake Champlain. Everypropellerishandfinishedand precision gauged for quality and consistency. Availableinrighthandrotationsizes 16, 18, 20, 22, 24, 25 and 26 pitch. Availableinlefthandrotationsizes 16, 18, 20, 22, 24 pitch. 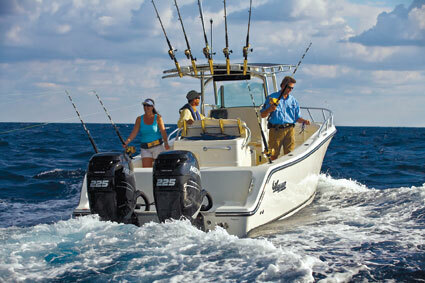 Day Brothers Boats has been a trusted Evinrude E-TEC dealer for years. We have been proudly serving Lake Champlain, Burlington VT, the Adirondacks and Montreal since 1948.